Caption: Syrian artist Nada Odeh (center) inspired students to create paintings about peace, action, safety, caring, and beauty. Photo by El-Wise Noisette. Inside a bustling NYSUT conference center, 75 students spent part of their summer this week learning about the importance of voting, how they can help support the education of girls in Afghanistan and how art can color the world with intention. 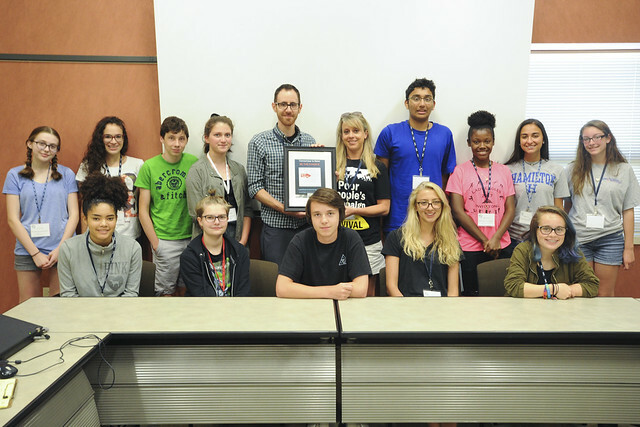 It was all part of a packed agenda during the Capital Region Institute for Human Rights summer symposium, where students learned how to make gains and promote human rights causes they believe in. For three days they listened, asked questions, debated, and honed in on speakers from as far away as Syria and Afghanistan who shared their quest to improve the lives of others. “This is by far the richest country in the world, with the most opportunities,” said NYSUT Secretary-Treasurer Philippe Abraham, who oversees social justice initiatives for the union. “Make sure this country remains a beacon,” said Abraham, who came to America at age 17 from Haiti and went on to become a middle school, high school and college teacher. Seated at various round tables with a teacher, union leader or legislator, the students’ task as budding activists was to convince the adults — each of whom represented themselves as a lawmaker — to support a specific cause. And they needed to marshal research, passion and statistics to make their case. Pitches included pushing for a later start in the morning for high schools to accommodate the documented sleep changes in adolescents. The teens argued the later start would improve attendance, cut down on tardiness, and improve the mental health of students. “They brought their own perspective,” said Mike Libertucci, a teacher with the Schalmont Teachers Association. Libertucci was joined by Mary Beth Flatley, president of the Schalmont TA, Seth Cohen, president of the Troy TA, and Scott Dolan, president of the North Colonie TA — all of whom volunteered to help students craft the elements necessary for activism. The teens were challenged, too. Meanwhile, Assemblyman Angelo Santabarbara, D-Schenectady, asked the students how teachers, bus drivers and custodians would feel about the later start time. He suggested the students find out what their concerns would be, and to address them. This is how coalitions and grassroots campaigns are built. “By pushing the school day further into the night, it affects homework, and prep time that teachers spend to prepare lesson plans,” he pointed out. Parents concerns need to be considered, too, because student sports and after-school activities would be affected, he said. The feedback provided to the students reinforces in them the need to be prepared when advocating for a cause. Many teens that attend the institute leave with a spiked interest in specific projects, and then go on to fundraise or volunteer to help those causes. And they also leave eager to put to use their hands, hearts and minds, to help people in need. Nang Attal, a recipient of the United Nations Youth Courage Award, talked to the students about the obstacles he faced in starting a school for girls in Afghanistan, where women are traditionally not educated. When economic sanctions were put in place against Afghanistan by the U.S., Nang said it was the poor who suffered most. Once he was in high school, his mother asked him to teach younger girls how to read and write in their home. He decided he wanted to pass on that gift of education further to the girls throughout his country. Nang, who also teaches at the school, talked of teaching classes after bombings, and how the war in Afghanistan is the longest war in U.S. history. Students who asked about supporting the school were told they could contribute through The Giving Circle, a Saratoga-based humanitarian group that helps people locally and globally. The organization is now helping to train 50 teachers for the Afghanistan school. Nang said girls educated to grade 9 are already becoming midwives and saving lives. Meanwhile, Syrian artist Nada Odeh spoke to students about “the art of revolution,” introducing them to art as a means to promote justice and human rights. As an activist, humanitarian, artist and poet, Odeh uses her art to color people’s minds with awareness. She paints refugee children, showing them as princesses in the way that many young girls see themselves. She depicts refugee camps, showing people dreaming of other lives, and speaks of people leaving Syria because of ongoing violence against dictatorship. Each student was then provided their own paint and canvas, on which they made paintings about peace, action, safety, caring, and beauty.